A tier-1 automotive part supplier required an assembly cell capable of installing one bushing and two sleeves into a right- or left-hand steering knuckle, utilizing a single operator in 59 seconds or less. In automotive suspension, a steering knuckle contains the wheel hub or spindle, and attaches to the suspension components. Steering knuckles, like the automobiles they complement, come in many shapes and sizes. The automotive supplier knew they needed a precision machine builder with the ability to custom-design to their exact specifications. But they also were seeking a company that could act as a partner, with technically strong mechanical and controls engineers who would search for thoughtful solutions to improve the manufacturing processes. Ahaus Tool and Engineering was brought in to design and build an innovative, robot-integrated, automated assembly cell incorporating a six-axis robot, inclined feeder and bushing press. The sleeves are bowl-fed into the machine on an inclined track which feeds the automated sleeve press. The robot utilizes two grippers to handle a knuckle and bushing simultaneously, picking the bushing out of the incline feeder, loading it into the bushing press, and holding the knuckle in place so it can be pressed. The completed knuckle assemblies are then pin-stamped and placed onto outgoing conveyors. Throughout the 59-second assembly cycle, the machine’s load cell is collecting in-process, real-time data to be measured and analyzed. This data is fed into the on-board computer, which is able to detect inaccuracies or imperfections, immediately removing the defective component and placing it in a fault bin for recycling. The assembly cell runs automatically, so the operator’s only functions are to feed parts into the inclined bushing feeder, unload finished parts when necessary, and monitor the machine for safety purposes. The machine will run for about two hours before needing more parts. Ahaus Tool and Engineering has many other special options for Automation Equipment, working with customers every step of the way, through conceptual design, engineering, service and support to meet their specific requirements. For more than a quarter-century, Ahaus has been designing and building special applications and automation equipment. 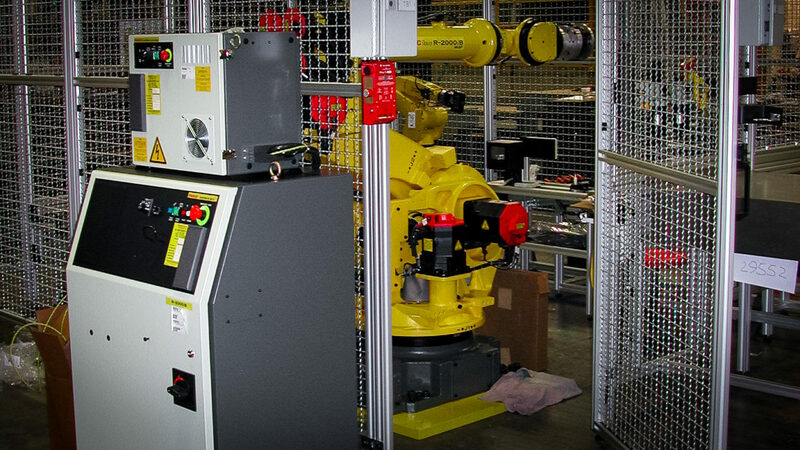 Our extensive experience with industrial automation equipment includes: assembly, part joining/crimping, bearing insertion assembly, automation of part handling, robotic systems integration, process controls and custom metal removal. We incorporate feeder bowls, part handling and joining into a fully automated or lean assembly system.